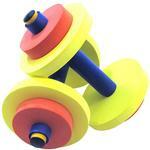 Fun and fitness for kids dumbbells promotes a healthy activity based lifestyle. To help your little one get into fitness right from the start, these dumbbells are just the thing. They probably wont start mixing protein powder into their fruit juice just yet, but theyll love to get the feel of pumping iron with the fun colors and safe design of the WC Redmon Fun and Fitness Dumbbell Set for Kids. This set is made with kids in mind, to give them the feel and fun of working out.